Are Oxalates at the Root Cause of Your Thyroid Condition? Preliminary research has tied oxalate build-up to thyroid disease, and while I’ve never had a problem with oxalates (knock on wood), other thyroid patients have reported oxalate issues. While oxalate build-up has been predominantly tied to kidney stone formation, a study of thyroid autopsies found that 79% of adults were found to have oxalate crystals in their thyroid glands, with prevalence increasing with age. Oxalate is a substance that is found in some foods and is also a waste product made by our bodies and excreted through our kidneys. While a standard diet takes in about 250 mg of oxalates, when eating a low oxalate diet, consuming under 100 mg is recommended, but under 50 mg is ideal, unless your doctor suggests otherwise. Oxalates form salts in the body by combining with calcium, after we consume plants that have a high oxalate content (such as dark leafy greens). When our body can’t process the calcium-oxalate compounds, they crystallize and lodge in our organs, causing inflammation and/or can turn into painful kidney stones. The other foods that are commonly eaten on a Paleo diet that have oxalate content above 50 mg per serving include baked potatoes, beets, cocoa powder, and okra. Raspberries come in close, at 48 mg per serving! There are some foods that have an ultra high oxalate content. However, we use them sparingly (like black pepper). These foods are usually not as much of a concern unless you are using more than 1 tsp at a time (that’s a lot of pepper!). I think the least expensive and most effective test (especially if you’re having symptoms) is a trial of the low oxalate diet. While it would be best to limit all foods that contain oxalates, it’s not ideal or realistic to stop them all at once. It’s also not going to make a person feel well. Once you stop eating the oxalates, your body is going to detox, and you may go through a period of “oxalate dumping,” where too many oxalates try to leave your body all at once and cause unpleasant symptoms. Start by eating moderate oxalate foods for one week (reduce your intake to less than 100 mg of oxalates per day). Let the body adjust, and then go to low oxalate foods (less than 50 mg of oxalates per day). When a higher oxalate food is consumed, it should be rotated, to avoid over-concentration of oxalates and sensitivity to that food. Once a person feels better, it’s easy to slowly let high oxalate foods creep back in. These foods should always be rotated. If symptoms return, it’s important to reduce oxalate intake immediately, to avoid possible stone formation. Potential root causes of oxalate sensitivity are due to improper breakdown of oxalates in the body, which can be caused by various factors, such as: a rare genetic disorder, any issues that affect the small intestine such as small intestinal bacterial overgrowth (SIBO), gastric surgery, Crohn’s disease, or short bowel syndrome, and dysbiosis, which can result from past antibiotic use. People with a low intake of calcium (such as those following a dairy-free diet, which is otherwise beneficial in Hashimoto’s) may find that oxalate issues are exacerbated. This is because calcium in our foods can reduce our absorption of oxalates. I recommend screening for SIBO, as this is present in 50% of people with hypothyroidism anyway, and addressing dysbiosis is a necessary part of your plan to overcome oxalate sensitivity. I’ve rarely seen oxalate issues in my clients – we find that most of them see a big reduction in pain once they start on the recommended protocols, including my favorite probiotics, digestive enzymes, and vitamins that I have recommended in previous blog-posts and in my book. However, I’ve recently had a few friends who were experiencing oxalate issues, so I wanted to get to the root cause of this. In researching this article, I was pleased to see that the probiotics and supplements I most commonly recommend can help with oxalate issues! Bifidobacterium lactis can be found in Ther-Biotic Complete, and Probiotic 50B, two of my favorite high dose probiotics. Enterococcus faecali is found in Dr. Ohhira’s brand of probiotics (please note, this brand does use fermented soy in the development of the probiotics, but most people with soy reactions should be able to tolerate it). MegaSporeBiotic and S. boulardii, my other two favorites do not contain oxalyl-CoA decarboxylase containing strains to the best of my knowledge but may still be helpful in restoring gut health. In addition to probiotics, conjugated bile acids (CBA) can also help to clear out oxalates by preventing their reabsorption in the body. A megadose of 9 grams per day of natural conjugated bile acids was used in people with short bowel syndrome, who are known to hyper-reabsorb oxalates due to the structural bowel changes present with the disorder. Within 3 months, their oxalate levels measured normal using CBA. Calcium can block the absorption of oxalates, and people with a low dietary intake of calcium are more likely to be oxalate sensitive. (Please note that while dairy is rich in calcium, and although oxalates are not present in dairy, it is best to avoid dairy with Hashimoto’s). I like the B6 complex from Pure Encapsulations. If you are having any of the common oxalate symptoms, you may benefit from a 3-week trial of a low oxalate diet as described above + supplementing with calcium and B6 vitamins + probiotics + conjugated bile acids. Oxabact and Oxazyme have both been clinically tested to significantly reduce oxalates by directly providing the probiotics O.
Oxabact and Oxazyme have both been clinically tested to significantly reduce oxalates by directly providing the probiotics O. formigenes (Oxabact) and by providing the enzyme that breaks down oxalates (Oxazyme). At this time, the products are only available through clinical trials.Please note that while the probiotic and enzyme are technically supplements, they are currently classified as “orphan drugs”. Please note that while the probiotic and enzyme are technically supplements, they are currently classified as “orphan drugs”17 by the FDA, meaning that they are indicated for rare conditions and not widely available. Your doctor will have to work with a pharmacy that specializes in orphan drugs. Your doctor will have to follow a special ordering procedure, and these may not be covered by insurance. Has oxalate sensitivity been an “aha” moment in your journey? What has helped? Reid J, Choi C, Oldroyd N. Calcium Oxalate Crystals in the Thyroid: Their Identification, Prevalence, Origin, and Possible Significance. American Journal of Clinical Pathology. 1987;87(4):443-454. doi:10.1093/ajcp/87.4.443. Frishberg Y, Feinstein S, Rinat C, Drukker A. Hypothyroidism in primary hyperoxaluria type 1. The Journal of Pediatrics. 2000;136(2):255-257. doi:10.1016/s0022-3476(00)70112-0. Tintillier M, Pochet J, Cosyns J, Delgrange E, Donckier J. Late-onset primary hyperoxaluria triggered by hypothyroidism and presenting as rapidly progressive renal failure – description of a new mutation. Clinical Nephrology. 2004;62(08):155-157. doi:10.5414/cnp62155. Castellaro A, Tonda A, Cejas H et al. Oxalate induces breast cancer. BMC Cancer. 2015;15(1). doi:10.1186/s12885-015-1747-2. Shaw W. OXALATES CONTROL IS A MAJOR NEW FACTOR IN AUTISM THERAPY. The Great Plains Laboratory, Inc. 2015. Available at: https://www.greatplainslaboratory.com/articles-1/2015/11/13/oxalates-control-is-a-major-new-factor-in-autism-therapy. Accessed September 7, 2017. Hoppe B. Diagnostic and therapeutic approaches in patients with secondary hyperoxaluria. Frontiers in Bioscience. 2003;8(5):e437-443. doi:10.2741/1135. Cleveland Clinic. Kidney Stones: Oxalate-Controlled Diet | Cleveland Clinic. Cleveland Clinic. 2015. Available at: https://my.clevelandclinic.org/health/articles/kidney-stones-oxalate-controlled-diet. Accessed September 7, 2017. 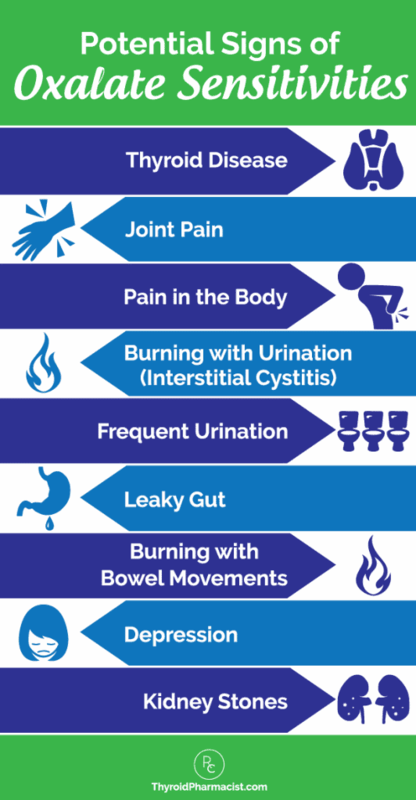 Pendick D. 5 steps for preventing kidney stones – Harvard Health Blog. Harvard Health Blog. 2013. Available at: https://www.health.harvard.edu/blog/5-steps-for-preventing-kidney-stones-201310046721. Accessed September 7, 2017. Hoppe B, von Unruh G, Laube N, Hesse A, Sidhu H. Oxalate degrading bacteria: new treatment option for patients with primary and secondary hyperoxaluria?. Urological Research. 2005;33(5):372-375. doi:10.1007/s00240-005-0497-z. Kelly J, Curhan G, Cave D, Anderson T, Kaufman D. Factors Related to Colonization with Oxalobacter formigenesin U.S. Adults. Journal of Endourology. 2011;25(4):673-679. doi:10.1089/end.2010.0462. Plotner B. Options With Oxalate Intolerances – Nourishing Plot. Nourishing Plot. 2015. Available at: http://www.nourishingplot.com/2015/03/07/options-with-oxylate-intolerances/. Accessed September 7, 2017. Okombo J, Liebman M. Probiotic-induced reduction of gastrointestinal oxalate absorption in healthy subjects. Urological Research. 2010;38(3):169-178. doi:10.1007/s00240-010-0262-9. Finkielstein V. Strategies for preventing calcium oxalate stones. Canadian Medical Association Journal. 2006;174(10):1407-1409. doi:10.1503/cmaj.051517. Health Resources and Services Administration. Orphan Drug Designations And Approvals List. ; 2016. Available at: https://www.hrsa.gov/opa/programrequirements/orphandrugexclusion/orphandruglist072016.pdf. Accessed September 7, 2017. Yakowicz W. How a College Professor Built a $42 Million Pharmacy for Rare Disease Drugs. Inccom. 2016. Available at: http://www.inc.com/will-yakowicz/inc-5000-2016-pantherx-specialty-pharmacy.html. Accessed September 7, 2017. Great article, professional and well written. Thank you, Izabella, in early 2016 I was following an all raw 98% vegan diet, which required high amounts of a drink called Gorilla milk, which was a combination of kale, celery, apple juices and Almond milk. Drinking up to 1 quart of this per day, lead to me having a racing heart and later a blood test confirming hyperthyroid. I have been unable to connect the dots until your videos and this complimentary article on the same topic. I’ve only had 1 day with avoidance of the high oxalate foods and avoiding dairy, grains, soy and eggs and wow, my heart rate has come down and I had the best rest last night in some time. Thank you for helping so much! Can having an Oxalate issue cause extreme bloating and water retention? Maura – please, understand that due to liability issues, I am unable to answer specific medical questions. Well this article has been a revelation! I have hypothyroidism (blood tests indicate inability to convert T4 to T3) that I am currently trying to treat with supplements and diet. Along with stomach problems, I have also struggled with hyperoxaluria for years (vulvodynia). It never occurred to me that oxalates could be destroying my thyroid gland! I have recently become a fan of Dr Josh Axe and concluded that my problems may have started with a leaky gut many years ago. This probably allowed oxalates as well as milk proteins, gluten and other undesirable toxins (I am allergic to wheat, dairy, yeast, soy) to penetrate the blood/brain barrier and create the health issues I have today. I am going to make an appointment with a local doctor (Knoxville) recommended in your “Hashimoto’s Protocol”. Too much to discuss in a post here, but I would LOVE to pick your brain about this! I also had vulvodynia for years, triggered by chronic thrush. After seeing a millions specialists, I finally got rid of it by taking Amitriptyline 40 mcg for 3 years. I was pain-free while taking it, then I stopped taking it to get pregnant and the pain never came back. So that is something to consider as well as cutting out oxalates. Peta – thank you so much for sharing your personal insights! I am really glad to hear you beat that pain! Thank you, thank you, thank you!!!! 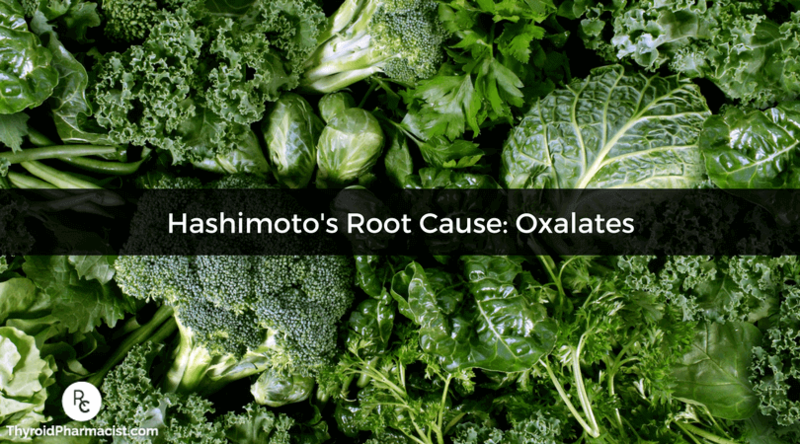 After years of trying to get to the bottom of my Hashimoto’s, your oxalate article got me thinking. I was eating so “healthy” I was literally killing myself. I had been eating large amounts of high oxalate foods for years. The day I read your article, I began to cut back and have been dumping steady for almost a month now, with no sign it slowing up. For the most part I feel a little better each week as long as I don’t go to fast. I now realize I have a long road to recovery but for the first time since I was finally diagnosed three years ago I feel I have hope. What really frustrates me is that I spent well over 300 dollars with an naturopath who examined my diet very carefully and yet seemed to have no idea I was consuming far too many oxalates. Thanks again! Sue – you are very welcome! <3 Oxalates are another variable that are relevant for some people but not all. If you are experiencing food reactions then it is best to cut out the foods you are reacting to. Every one is an individual and what works for one may not work for everyone. I have issues with gout. I had an occasion several years ago where we had leftover organic spinach so rather than waste it I had it in salads and cooked it, a lot of it in one weekend. I had one of the worst gout attacks I had ever had in the following days. One of my colleagues at work mentioned the high oxalate acid in spinach and gout issues. I’ve since created the chart like you have with oxalate levels of food, as well as what to eat or avoid for my Hashimoto’s Thyroiditis. It’s a work in progress. I am also finding that it seems as if certain oils used in cooking can create painful inflammation in my feet (it is different than a gout attack). Dave – thank you for following this page. In general, most people with autoimmunity need to find their food sensitivities, heal from infections, and eat organic; however, bioindividuality is important, not everyone will respond to the same interventions. The foods that heal one person, may not be the same for another. It might seem like a lot to give up, but feeling your symptoms fade away can make it feel like it’s all worthwhile. You will be reintroducing these foods once your gut heals. As a new vegetarian (1 yr now almost) I didn’t even think about this! I’m worried now and think I’m going to start with that test. Thanks so much. Citrus: joint inflammation in knees. Nuts: tendon pains especially around my left ankle — site of an old injury. Oxalates/Dairy/Eggs: overall muscle aches and perhaps joint aches in my fingers. My question is what can cause temporary swelling around where the thyroid glands are? This happened in the past when I had really big home cooked dinners. But I cannot remember now the exacts foods that I had. Most likely I had wine, steak, lot of veggies, pasta and nuts. I would notice the swelling around 11 pm- midnight and it would be gone by noon next day. And it was most prominent on the right side. Tim – thank you for following this page. I highly recommend that you work with a functional medicine clinician. It’s an entire medical specialty dedicated to finding and treating underlying causes and prevention of serious chronic disease rather than disease symptoms. Thank you very much for your reply and the information in your website. This is quite interesting. I have Hashimoto’s, but not kidney stones. But I met a guy today who suffers from kidney stones and possibly might have thyroid problems (his mother is on thyroid meds). Question that comes to mind. Following the AIP which focus a lot on greens, but they are high in oxalates…. I don’t have the symptoms you’ve written about, except the joint pains. I thought to tell this guy to have the thyroid antibodies tested and then follow the AIP – but now I simply don’t know. Marelize – thank you for following this page. Oxalates are another variable that are relevant for some people but not all. It’s best to work through the protocols first. If you are experiencing food reactions then it is best to cut out the foods you are reacting to. Every one is an individual and what works for one may not work for everyone. Dr. Izabella, this is an excellent article. It seems that oxalate excess affects the thyroid; and thyroid activity also affects oxalate levels. I have been working on reducing oxalates in my diet for about 2 years. Joining the “Trying Low Oxalates” group has helped more than I can say. I have also been struggling with weak adrenals and hypothyroidism for years (non Hashimotos). Once I began taking hydrocortisone and thyroid medication, I found that i was not absorbing nearly as much oxalate. Even more, my body seemed to be shedding(dumping) oxalate at a rapid rate. Before the thyroid meds and hydrocortisone, for whatever reason, I was very prone to accumulating oxalate, and my diet needed to be stricter. But I’m glad it worked out this way! Could you take Coral Calcium instead? Carl – thank you for reaching out. I am not able to advise you on whether this supplement or any other supplement would be appropriate for you and your specific health needs without a comprehensive health assessment. I recommend you discuss the use of this supplement with your personal doctor. is there an article about the types of Calcium?